Container Systems got its start in 1969, selling corrugated steel containers to clients in the manufacturing industry. In the 45-plus years since, we’ve grown and adapted to our customers’ needs to become the company we are today: a leading provider of materials handling equipment and installation services. 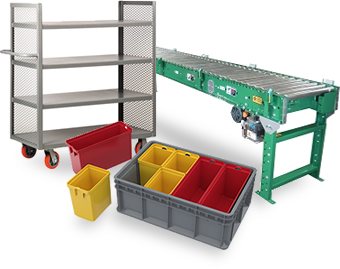 With a huge selection of pallet rack, shelving, mezzanines, in plant modular offices, and more, as well as full-service installation capabilities, Container Systems offers complete, start-to-finish solutions for your safety, efficiency and productivity opportunities. Our experienced, knowledgeable team will work with you to develop the ideal solutions for your business—you know what you need to achieve, we know how to make it happen. Whether your facility needs two sections of shelving, a vertical lift module, installation services, or wall-to-wall storage and materials handling overhaul, Container Systems is your number one resource. Request a quote today, or contact Container Systems for more information. Container Systems is a material handling equipment and installation provider in Chicago, Illinois. We have professionals working on material handling systems, equipment, and installation on a daily basis in Illinois, Indiana, and Wisconsin. We have done and do material handling work throughout North America. For Storage Products (all types of Pallet Rack, Cantiler Rack, Shelving, Cabinets, and more) in the United States, Illinois and surrounding states, Chicago Area, Container Systems has the experience and solutions needed.